Community air pollution is a problem that is as old as civilization, and on a smaller scale must date back to prehistoric cultures. Surely the black linings of caves inhabited by some of our ancestors are evidence of indoor air pollution with wood or coal smoke, pollutants which have drawn more attention recently as a significant risk factor in the development of lung cancer. Understandably, smoke was the first pollutant to be regulated . In the present century, there have been several major air pollution "disasters" (Meuse Valley, Belgium, 1930; Donora, PA, 1948; London, 1952). To the extent that real changes in the control of air pollution occurred in the United States, these episodes apparently did not generate sufficient political or public health interest in the health effects of air pollutants. Gas carbon monoxide (CO) is a colorless gas and also has no smell, but gas is quite toxic, gas CO is a result of the disposal of the car or the engine of a letup not perfect combustion. Sulfur oxide is one of the substances that can produce sulfur acid, SO2 which mixes with air and the Sun will eventually cause acid rain which can give impact to the environment or to humans. Of the many human respiratory disease experienced some of them. This disease was initially caused by air pollution, be it from the smoke of a motor vehicle, factory fumes, cigarette smoke and more. Not only have an impact on the human respiratory system, but also have an impact on animals. The animals will also be experiencing respiratory disorders. In addition to interfere with the respiratory system of humans and animals, air pollution also led to the growth of the plants become stunted. This can occur because of the dirty air that can lead to the occurrence of a change in the morphology of plants such as leaf yellowing, becoming reduced stem growth and seed produced is not as good as on the conditions of the air cleaner. In addition, air pollution can also lead to the onset of disease in plants such as necrosis, the emergence of black spots on plants as well as chlorosis. Air pollution is also caused by SO2 gas can cause the occurrence of NO2 & acid rain. This occurs because the sulfur and nitrogen are mixed in the air that will then be making nitric acid and sulfuric acid. Both substances this acid slowly to form clouds and rain came down with a high acid content. AirPolusi air pollution or water pollution is the occurrence of a change in an order of water environment. Where water pollution is caused by a variety of pollutants, which are derived from waste disposal, waste household industry and some unexpected events such as drowning or burning of the fuel carrier oil. As for the substances included in air pollutants is Pb, Hg, and Zn. 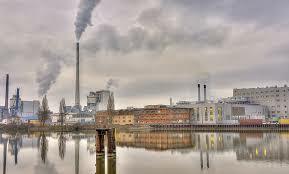 these Substances have high enough levels of pollution to the waters when a substance is contaminated waters. The impact of water pollution can cause the ecosystem water becomes extinct. That is because the water is being contaminated by dangerous substances will give an impact on organisms that live in the water such as zooplankton and phytoplankton. When these organisms became extinct, then the water animal food needs will be limited and difficult to get to the food supply, it is certainly also will make the animal in the water became extinct. Pollution that occurs in water can result in reduced oxygen content, so that living creatures that live in the water will have difficulty in breathing. In addition, when not immediately follow up, then chances are the largest living things in the water will become extinct. Next is the impact can cause the water to become cloudy. This occurs due to the abundance of waste from households or factories that are not prepared in advance, so it still contains many chemical substances that are dangerous. Water that is experiencing pollution will certainly be the source of the disease. Some diseases are often inflicted such skin diseases as well as digestion. This happens because of the murky water that contains a lot of bacteria and chemical substances harmful to the human body. Soil pollution or soil contamination is environmental pollution that occurs in the soil. The source of the pollutants cause pollution soil various, including liquid waste is derived from households or industry that have not processed again, the existence of a chemical waste from city facilities as well as a heap of garbage that is not managed by the right way. Soil pollution can cause reduced fertility rates, so if not immediately actionable, then chances are the largest crops being easily wither. Not only that, when the plants are constantly being in contaminated soil, then the result of the plants will not be maximized, it is certainly also a disservice to the farmers fields. The land which is the container of living quarters for animals land or other components. In a land of many substances pollutants in ground ecosystems, then it will be disturbed, as well as the interaction between components of biotic and abiotic component becomes unbalanced. This soil ecosystem imbalances will have an impact on the ecosystem surrounding environment. Contaminated land a variety of substances pollutants will cause impacts to vegetation, moreover also can ruin the aesthetic value of the environment. Where in there is a pile of junk in a land that is not treated may cause unpleasant odors, besides environmental conditions lack of greenery will add to the bad situation. This is where the aesthetic value of environmental views, when the beautiful and comfortable environment is occupied, it will be a lot of living in such a place, so did the opposite.